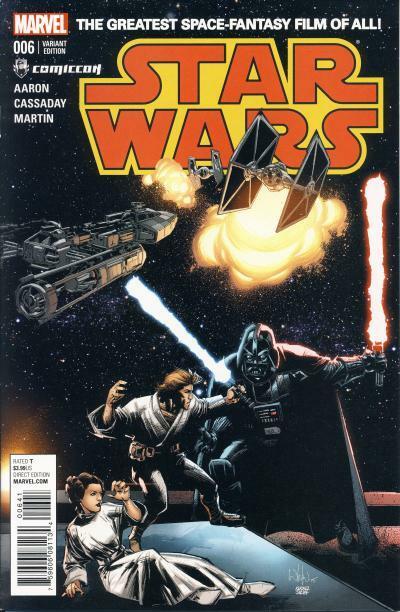 The final chapter in the Star Wars movie adaptation, Star Wars #6, has a cover showing Luke Skywalker and Darth Vader having a lightsaber duel while a dogfight occurs in the background. 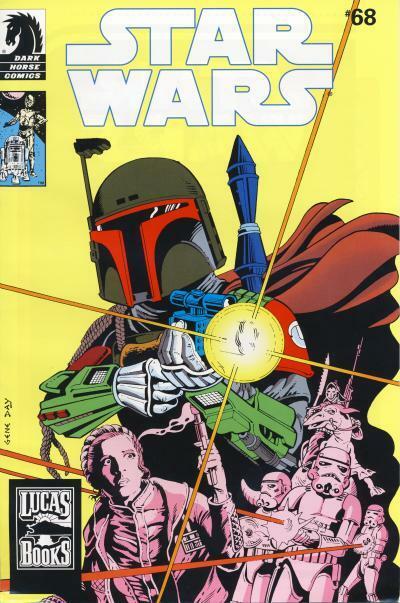 Whilce Portacio drew a homage to this cover for the Montreal ComicCon exclusive Star Wars #6. 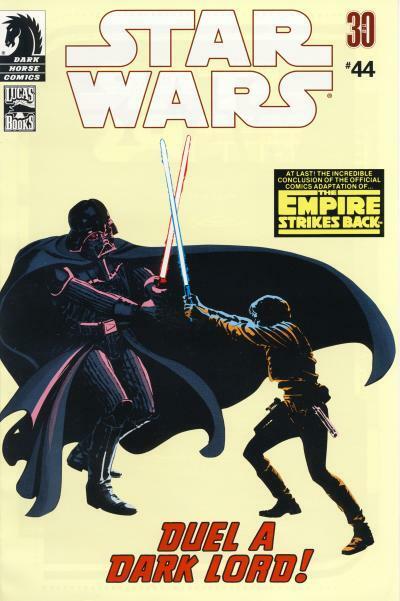 On the homage cover, Darth Vader is more menacing due to the heavier shadows and Luke Skywalker is brandishing a blue lightsaber instead of the red lightsaber he is show using on the original cover. The Star Wars logo on the original cover is different than the logo on the new cover. The new cover uses the logo found in the movies and on most products. The original logo used by Marvel is similar but the letter are more squished and the W is different. That logo was used throughout the original Marvel run. 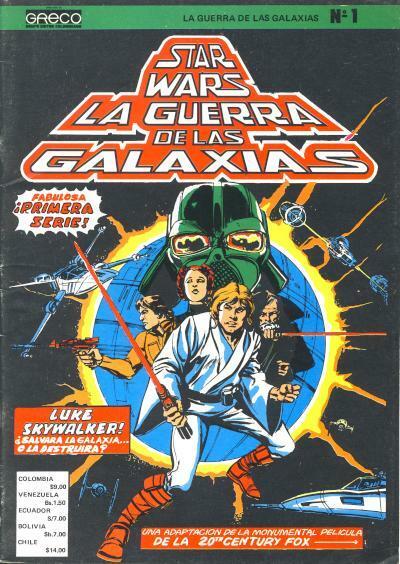 Lucasfilm was more lax at the time; many foreign comics used localized logos in the native language until Lucasfilm asked for all Star Wars licensees to use the standard Star Wars logo. In February 1978 Star Wars was first shown in German cinemas. 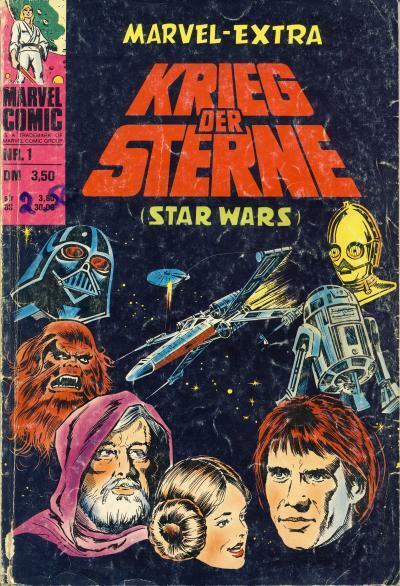 The following month, the German publisher Williams-Verlag released Krieg der Sterne #1, a 60 page magazine-sized comic which contains Marvel Star Wars #1 - 3 translated for German readers. Williams-Verlag would finish the movie adaptation in Krieg der Sterne #2, another 60 page issue published in April 1978. 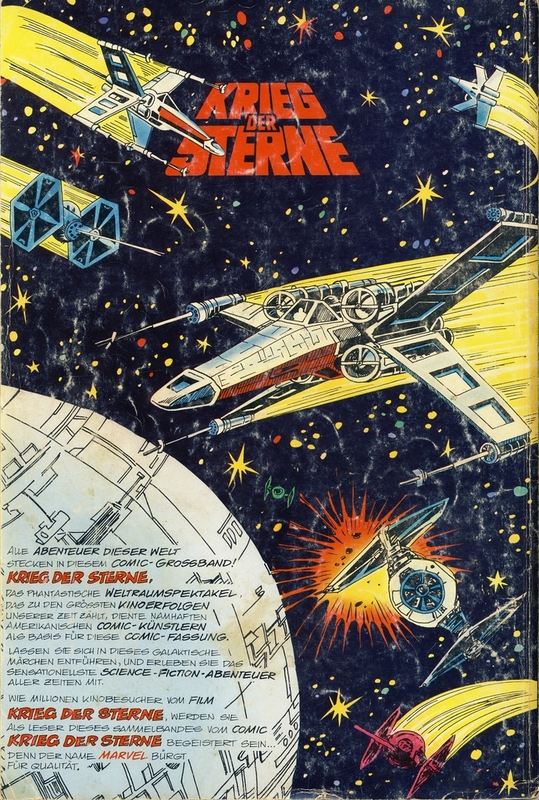 Finally, Williams-Verlag published the German editions of Marvel Star Wars #7 - 10 in Krieg der Sterne #3 in May 1978. Krieg der Sterne #3 is 68 pages long and is missing several pages from the four 17-page issues in order to contain the entire adventure of Han Solo and Chewbacca on the planet Aduba-3. In November 1978 Williams-Verlag collected the 3 magazine-sized issues inside a new cover and published the collection as Marvel-Extra Krieg der Sterne #1. Marvel-Extra Krieg der Sterne #1 is large, measuring 11 1/4" x 7 3/4", and heavy. The weight comes from the paper stock which is high quality and comparable to modern paper stock. All 3 magazines including the covers are bundled in this comic. Whether or not these were returns or new printings is unknown. The cover price for issues #1 and 2 is 3.50 deutsche mark and the larger issue #3 is 4.50 deutsche mark. The bundle is only priced at 3.50 deutsche mark making it an extremely inexpensive collection! For this reason, I believe this collection contains returned magazines. All the adventures of this world stuck in this big comic! Star Wars, the fantastic space opera, the biggest cinema successes of our times, this comic version was created by well-known American comic-artists. Let the Galactic fairy tale enthrall you, as you experience the most spectacular science-fiction adventure of all time. Like millions of cinema visitors for the film Star Wars, you will be excited as a reader of this anthology of the Star Wars comic... Because the name Marvel stands for quality. 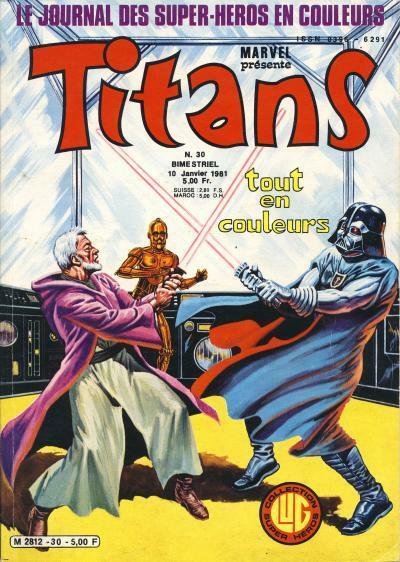 The final issue of the French anthology Titans magazine to feature Star Wars is Titans #95. This issue contains 2 U.S. Marvel Star Wars comics, issues #96 and 97. The cover is another original painting that shows Luke Skywalker confronting Lumiya. Most of the Star Wars covers for the Titans magazine are terrific paintings and this cover is no exception. 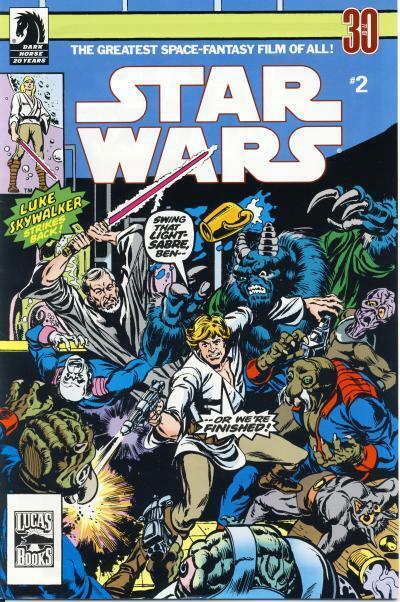 Since Editions LUG published the Marvel Star Wars stories in the Titans magazine several years after they came out in the U.S., I can only imagine they saw the mess that the Star Wars title became after Star Wars #93. The Star Wars title had recently published several issues by various artist, but Tom Palmer did the inks or finishes that provided some conformity between those issues. 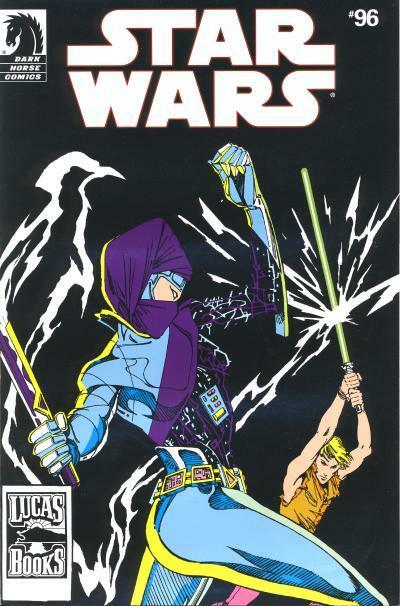 With Marvel Star Wars #94, Cynthia Martin became the semi-regular artist on the Star Wars title. Her work was influenced by Japanese manga and was jarring to readers use to seeing the more traditional art on the title. Her art is dynamic and cartoony and is incongruous to Star Wars. I can only guess Mary Jo Duffy, the writer, began writing stories tailored to Cythia's style, because the stories started taking a non-serious tone. It did not help that these stories occurred after the Return of the Jedi and the main antagonist of the movies, the Empire, had been defeated, leaving Mary Jo Duffy with no direction. 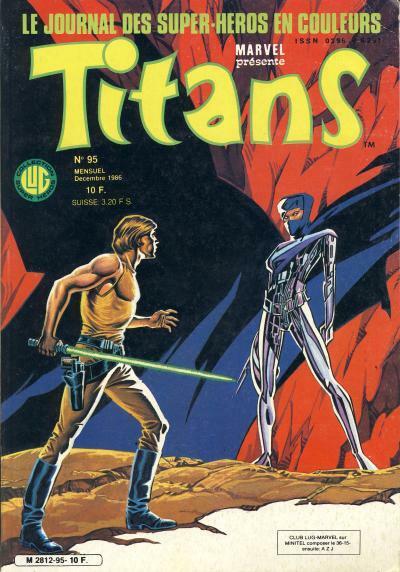 Star Wars #94 was not published in the Titans magazine, probably due to the ridiculous and over the top humorous nature of the story. Star Wars #96 and 97 are some of the last serious stories in the Star Wars title and provide closure to the Lumiya arc so it made sense that they were published, even though the art clashes with the serious nature of the stories. I know exactly which issue of the original Marvel Star Wars title that I purchased out of habit to keep my collection complete rather than purchased because I enjoyed the story. Eventually it happens to every collector who collects comic titles; in order to keep a collection complete, you end up buying issues of a title that you do not enjoy. That is not to say there was not the occasional clunker in the Star Wars title before then, because there was. 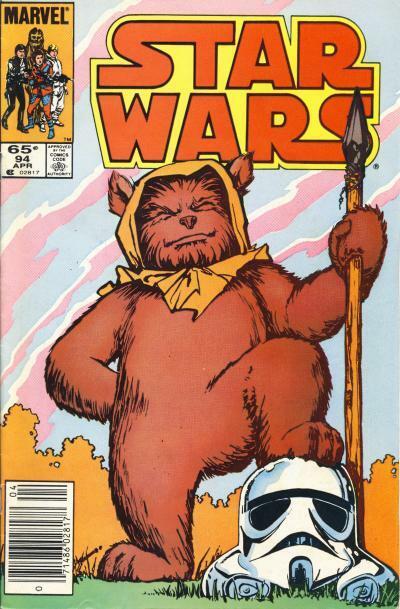 But with Star Wars #94 in a story titled Small Wars, the rest of the Star Wars run became a chore to buy and read. There were a lot of things going wrong with the Star Wars title when Star Wars #94 came out. The title did not have a regular artist since Ron Frenz provided breakdowns and Tom Palmer provided finishes on issue #82. 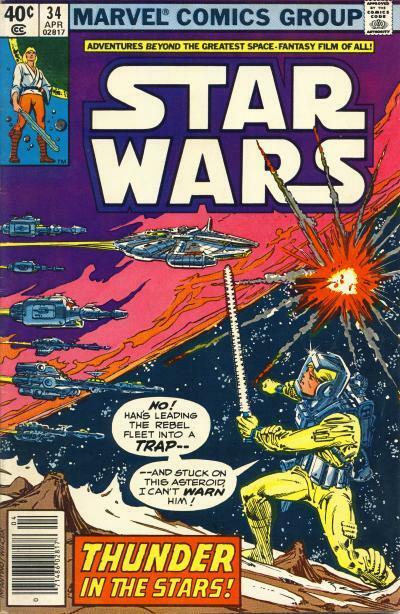 Mary Jo Duffy had been using humor sparingly in the title and for the most part that humor fit with what was expected in a Star Wars story, although Star Wars #77 pushed it to a limit that was close to unpalatable. 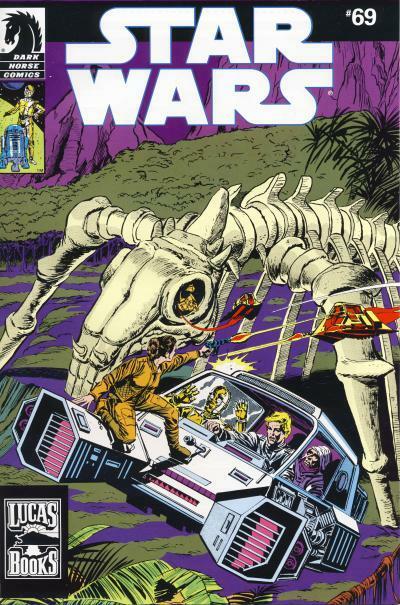 It was also clear that post Return of the Jedi, Mary Jo Duffy did not have a clear direction to take the main characters in and we were treated to several standalone stories, although the resurrection of Shira Brie as Lumiya in Star Wars #88 and the introduction of Knife of the Nagai species in Star Wars #91 were promising. Unfortunately, with Star Wars #94, we did get a semi-regular artist named Cynthia Martin and the Star Wars title was never enjoyable again. Cynthia Martin's art was strongly influenced by Japanese manga, but not necessarily those elements of manga I enjoy. I enjoy the dynamism and sense of action that manga provides. Cynthia Martin brought that, but also a cartoonish style that was unwelcome to someone who appreciates traditional American comic art. Her characters were exaggerated and uncomfortable to look at. To make matters worse, Mary Jo Duffy adapted her stories to Cynthia's style and Marvel's Star Wars became a humor title instead of the serious comic it had been. In Small Wars we are introduced to Hirog of the Hiromi species. The Hiromi are green bipedal insectoids that wear red berets and are bent on galactic conquest. Honestly, these characters make one wish for the return of Jaxxon as a regular cast member. They are played up for laughs and their inclusion ushered in this title's ultimate demise. In this particular issue, Hirog, Admiral Ackbar's aide, tries to break up the Alliance of Free Planets by starting a war between the Ewoks and Lahsbane. Unfortunately, the ludicrous nature of this species does not end with this issue as the Hiromi are brought back several more times as antagonists for our heroes. 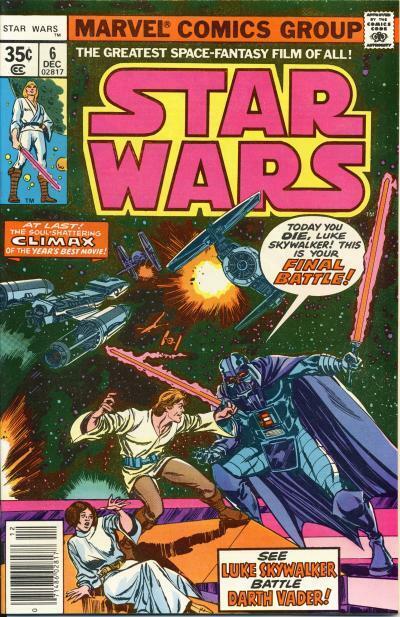 Mercifully, the original Marvel Star Wars title ends with issue #107. Once a year, I sit down to read the Star Wars: A Long Time Ago trade paperbacks that Dark Horse published reprinting the entire Marvel run. I read the first 6 volumes and always skip the last volume. I remember disliking Mike Mignola's art on Alpha Flight and Walt Simonson's art on Thor when I first saw them. But over the years, I began to appreciate the work these artists were producing and have grown to like their art. I now like the work they did on Alpha Flight and Thor. Unfortunately, the years have not gotten me to change my opinion of Cynthia Martin's work on the Star Wars title. Her style was all wrong for the title. Not surprisingly, the final issues of Marvel's original Star Wars title are some of the lowest printed. I cannot imagine too many Star Wars fans stuck with this title until the end after she became the regular artist. It is unfortunate these final issues are also some of the most sought after, especially when one understands just how bad these issues really are. I have created a Facebook page for the Star Wars Comic Collector website in the hopes of generating more feedback on my blogs. The Facebook link is Star Wars Comic Collector on Facebook. The plans are to still publish blogs in Blogger, but have links to those blogs in Facebook. With over 100 blogs to convert, it will take me a few days until the Facebook Timeline reflects all the blogs. Going forward, that activity will be handled by IFTTT. Additionally, last month, I added a Star Wars Sales Estimates page which can be access from a tab on the tab bar. Monthly, I will update the sales data for the Marvel Star Wars titles in plot.ly which will update the graph on that page. Finally, I created a Past Polls page which also can be access from a tab at the tab bar. Routinely, as polls expire, I will move them to this page. I also added new polls to the main page. Incredibly, the first Star Wars (2015) trade paperback is on track to sell between 225,000 and 250,000 copies for it's first print. This is on top of the over 1,000,000 copies for Star Wars (2015) #1. This might help explain why Marvel has so far only solicited one reprint (Lando #1 2nd print) for the month of August. By withholding additional printings, that should help create more demand for this trade paperback when it is released in October. For the full story please visit comicbook.com's EXCLUSIVE: Marvel's Star Wars To Sell More than 200,000 Copies in Collected Edition. Over the years, there have been many fan-made comics produced for Star Wars. 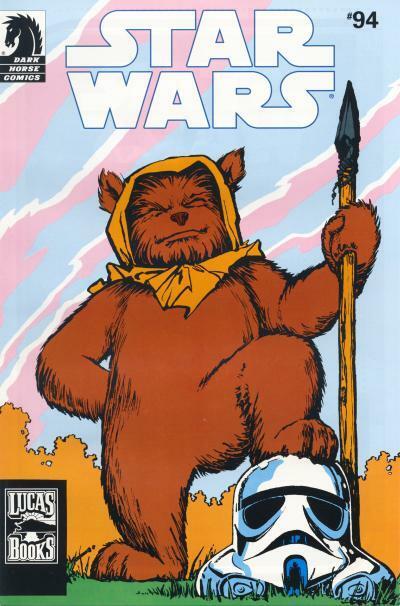 The first fan-made comic I became aware of many years ago was called Jawa Force by Dave Myatt and Morgan Purdie which was produced for the web. These fan-made comics range from amateur to professional, but they all have one thing in common, an appreciation for the Star Wars movies. The latest fan-made Star Wars comic I became aware of is called Green Leader by cartoonist Daniel Warren Johnson. This comic is only 11 pages long, but they are a very impressive 11 pages. Please take a look at Green Leader. Thursday night, John Tyler Christopher began selling a new black and white variant of Star Wars #4 with the Boba Fett action figure cover. This variant is limited to 3000 copies and sold out very quickly at $20 after been put on sale on his site. The comic has already been selling on eBay for up to $75. If this comic did not have the first appearance of Sana Solo, I would be hesitant to recommend anyone spend more than $20 for it. If Sana Solo proves to be popular and have longevity however, I can see a premium being placed on this comic since it will be the most limited cover with the first appearance of Sana Solo. I know there are other reasons for this comic to sell well including the current popularity of the action figure cover design and the Boba Fett cover. I believe the action figure cover design will prove to be a fad as Marvel and other publishers will keep publishing them until collectors grow tired of them. As for the Boba Fett cover, I'm of the opinion this is a fairly weak cover; Dark Horse had several Boba Fett covers over the year which are far superior to this one. And those covers are also on comics that contain an actual Boba Fett story. Over the years, many children and adults have dressed up as their favorite Star Wars character for Halloween. One of the first licensees for Star Wars products was Ben Cooper, which had Star Wars character costumes ready for Halloween in 1977. It is safe to say every year since 1977, Star Wars has been perennially represented on Halloween. For years, comic publishers have sought ways to get comics into the hands of kids so it should come as no surprise one way they have used to do this is to provide inexpensive mini-comics for people to give away on Halloween. 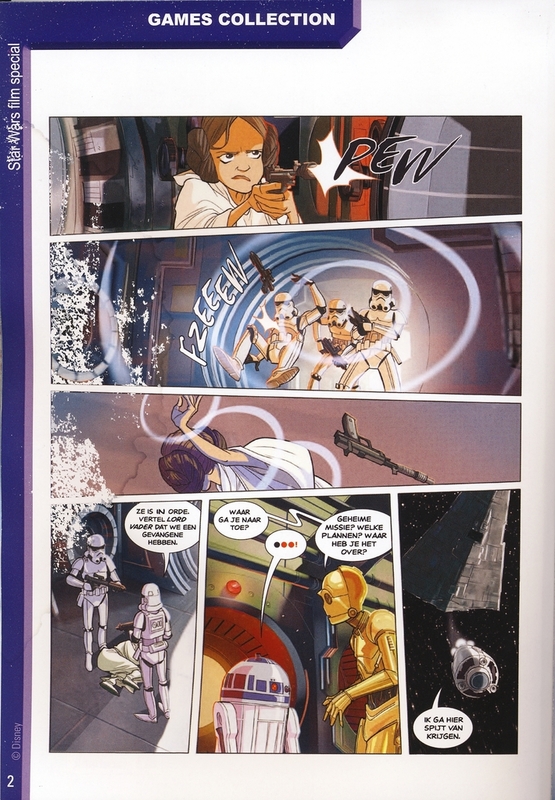 In 2009, Dark Horse published the Star Wars Halloween Special mini-comic. This full color mini-comic is 16 pages long and measures 5 1/2" by 8 1/2". It was sold in a bundle of 25 copies. 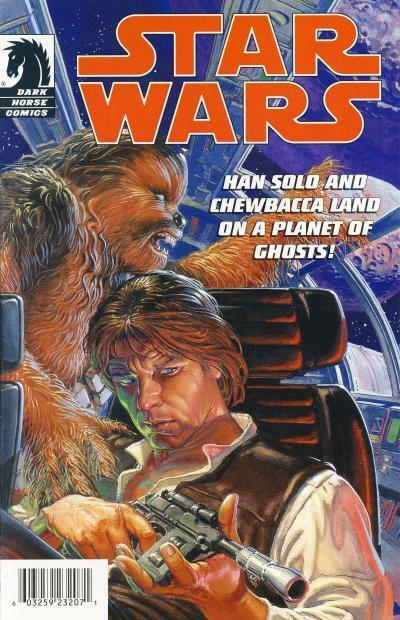 The cover for this mini-comic is the cover used for Classic Star Wars: Han Solo at Star's End #1. The story inside reprints Planet of the Dead from Star Wars Tales #17 and is written by horror writer Steve Niles, best known for writing 30 Days of Night. In the tale, Han Solo and Chewbacca are forced to land the Millennium Falcon in a seemingly deserted city on a uncharted planet due to low fuel. When they disembark into the fog outside the ship, they hear a ship crashing and are attacked by undead aliens. They retreat to the Falcon and in the morning they leave the ship again to encounter a local. She explains that the undead that they confronted were the 1000 crew members from an interplanetary expedition that had crashed in the natural fog on the planet. Every night at the hour of their death, the undead crew relive the horror of the crash and haunt the site. Han decides to use cargo aboard the Falcon to help the ghostly spacecraft land by placing lights to form a landing site. That night, the spacecraft lands, freeing the undead crew's spirits. Han and Chewie are rewarded by the locals with fuel for the Falcon. While on the subject of Halloween, in the 1982 movie E.T. The Extra-Terrestrial, Steven Spielberg had E.T. recognizes a child dressed as Yoda on Halloween. George Lucas returned the favor in The Phantom Menace in 1999 when E.T. 's species had representation in the Republic Senate! Right before the Empire Strikes Back, Marvel Comics began wrapping up ongoing story lines for several major protagonists to our heroes. Star Wars #31 - 34 contains a single story arc which shows the final fate for one of the Tagge brothers, the scientist Silas. In the final chapter to the arc titled Thunder in the Stars, Han Solo and Princess Leia are leading the Rebel fleet to the planet Junction, a major supply source for the Rebellion. The Rebels believe the Imperials, assisted by the House of Tagge, are going to use the Omega Frost weapon on Junction. Instead the Imperials have positioned the Omega Frost weapon in the asteroid corridor that the Rebel fleet is using to avoid the Imperial blockage of Yavin. Luke Skywalker is aware of the trap and destroys one of the Omega Frost towers, saving the fleet. The fleet discovers the ruse and destroy the nearby House of Tagge mining cruiser with Orman and Silas Tagge aboard. The cover for Star Wars #34 is one of my favorite covers in the original Marvel Star Wars series. Luke is wearing yellow space gear in the foreground while the Millennium Falcon leads the Imperial fleet through the asteroid field. During this period in the comics, the Rebellion fleet consisted of ships that were variants of the Imperial Blockade Runner used by Leia in the opening of the Star Wars movie. The cover stands out due to the vivid colors chosen. 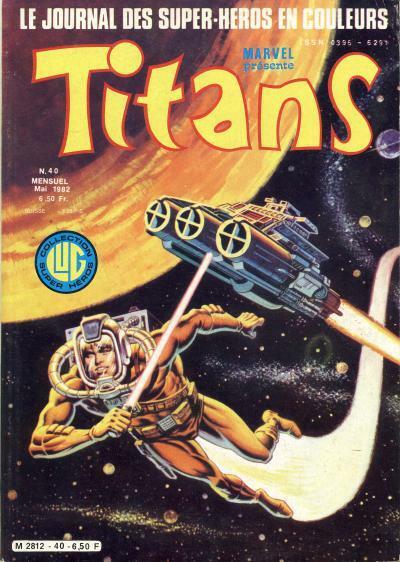 French Titans #40 shows Luke wearing the same space gear as he flies past the House of Tagge ship. Since Luke is nowhere near the House of Tagge mining cruiser inside the comic, this scene is more reminiscent of a scene from Star Wars #33 where Luke Skywalker dons space gear and infiltrates a House of Tagge operation where cargo is being transferred from the mining cruiser to an Imperial Star Destroyer. In the issue, Luke Skywalker is discovered and stunned by Imperial Stormtroopers overseeing the operation. During that scene, Luke never wields his lightsaber however. Additionally, the artist is showing the House of Tagge mining cruiser flying in the wrong direction! Those 3 round cylinders are the engines, so the ship should be flying away from Luke, not toward him! The original Marvel Star Wars series published several standalone stories in-between the larger stories arcs in the early years of the title not dissimilar to the approach Marvel is taking with the new Star Wars series. One standalone story that took place between the Wheel saga and the siege at Yavin stories was called Silent Drifting in Marvel Comics Star Wars #24. This story was originally published in the British Star Wars Weekly #43 and 44. 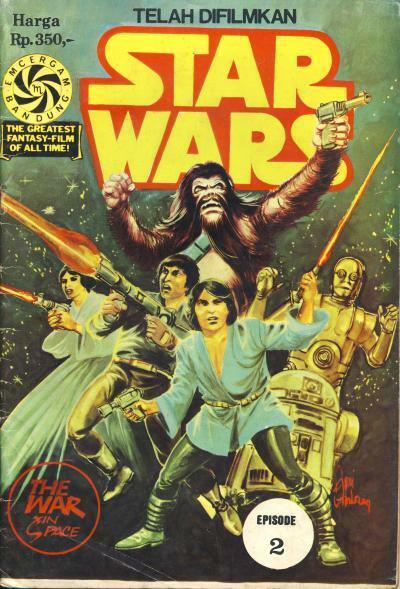 The comic is framed by a sequence aboard the Millennium Falcon where Han Solo and Chewbacca destroy some pursuing TIE Fighters with Luke Skywalker, Princess Leia, C-3PO, and R2-D2 as passengers. Prompted by Han's boasting, Leia recounts a tale of Obi-Wan Kenobi in the Republic era travelling on a large pleasure cruiser towards Alderaan. Obi-Wan befriends a robot named 68-RKO and meets the criminal named Augustus Tryll. The cruiser enters the Merson asteroid belt where it gains the attention of several Merson ships. Mersons are hostile to the Republic and the ships begin pursuing the cruiser. Obi-Wan is invited by Captain Quasar to assume command when it is learned that a signal from the pleasure cruiser is being used to attract the Merson ships. Obi-Wan Kenobi uses the meager defenses on the cruiser to dispatch the Merson ships. Meanwhile, several drunk passengers on the cruiser learn of the pursuit and accuse the criminal Augustus of sending the signal. More Merson ships pick up on the signal and begin approaching the cruiser. Obi-Wan determines an alcohol dispensing machine is responsible for the signal and destroys it, saving the cruiser ship and Augustus. In the story, Obi-Wan Kenobi is wearing a blue/black jumpsuit with a white belt and white boots. He is also sporting a dark grey beard. 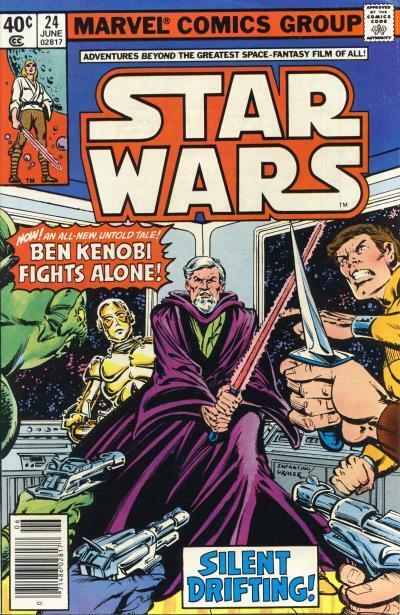 The cover shows Obi-Wan Kenobi wearing his familiar Jedi garb and is clearly aimed at attracting fans familiar with the movie. 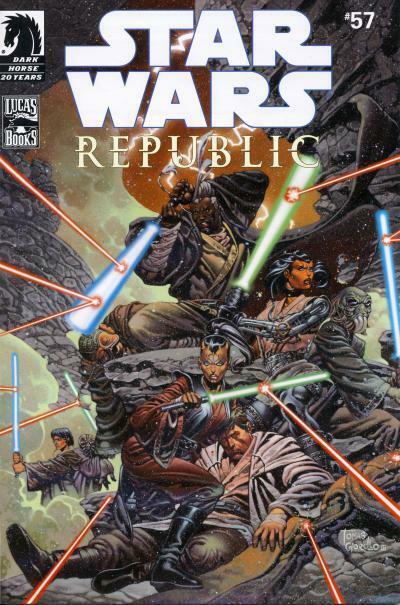 The cover does not actually depict events inside the comic, although there is one sequence where Obi-Wan dispatches an unruly passenger who is not happy about 68-RKO, a droid, milling around with the passengers. The droid on the cover is yellow while the droid in the comic is red. Also, Obi-Wan on the cover is yielding a red lightsaber where in the movie he uses a blue lightsaber. If the cover to Star Wars #24 is an abstract representation of the story inside, the cover to the French Titan #30 is even more disassociated from the story. On the French cover, Obi-Wan Kenobi is still wielding a red lightsaber, but he is engaged in battle with Darth Vader! The golden droid on the cover looks more like C-3PO than the droid from the story. Since neither cover is accurate to the story, I prefer the French cover that evokes the duel between Obi-Wan Kenobi and Darth Vader on the Death Star. Star Wars: Lando #1 will get a 2nd print on 08/12/2015. 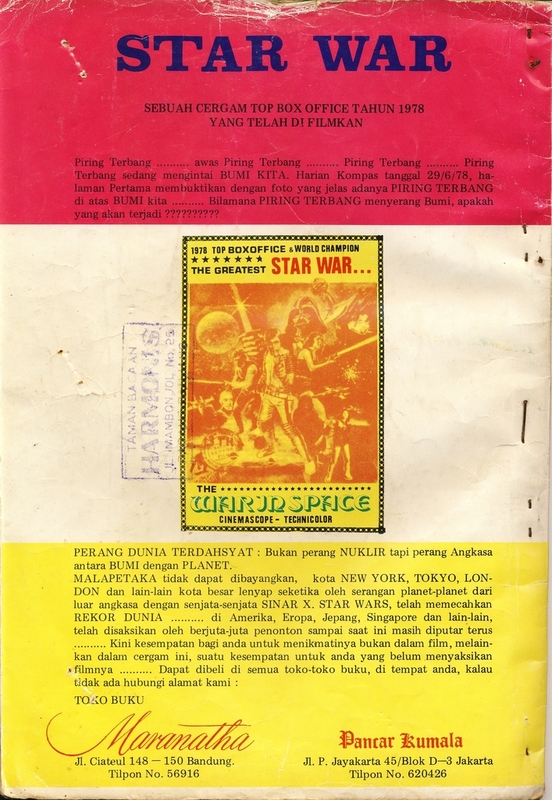 These two Indonesian Star Wars comics were published by Yayasan Karya Bhakti Bandung in 1978. These pamphlet sized, black and white comics contain the Marvel Comics Star Wars adaptation. 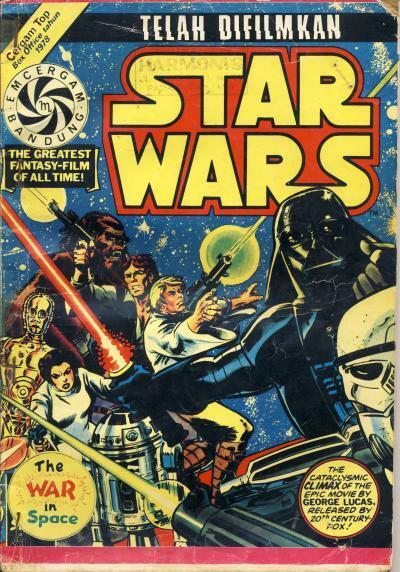 The first issue, published in July 1978, contains Marvel Star Wars #4 - 6 and has 54 pages of story. This first issue has the same cover as Marvel Special Edition Star Wars #2. 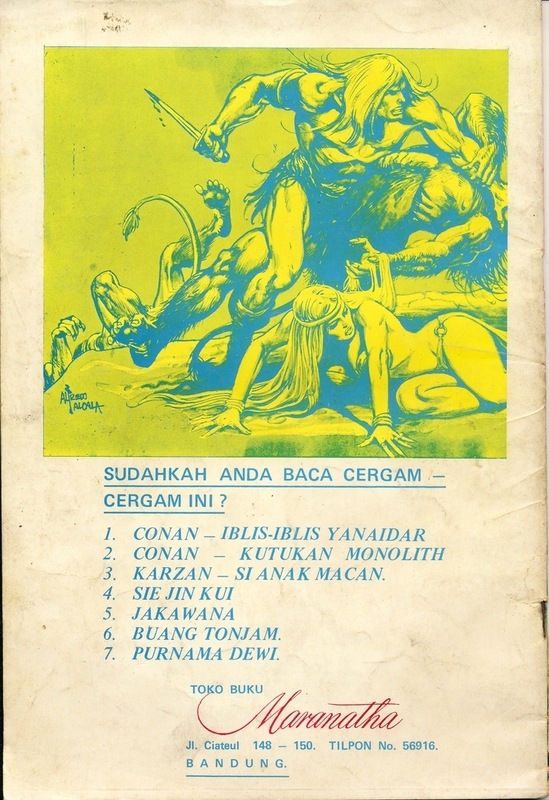 The treasury-sized Cypress comic also published in Indonesia uses the same cover. 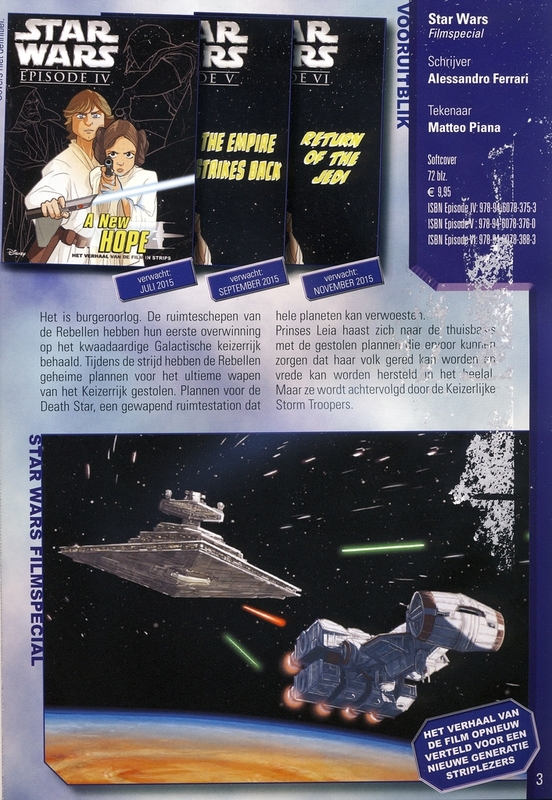 Much of the cover is in English, including the blurb The War in Space. Flying saucers ... Beware of Flying saucers ... Flying Saucers ... Flying saucers are stalking Our Earth. The daily Kompas on 29/6/78 on the first page proved with a clear photo the existence of flying saucers on top of our Earth ... When flying saucers attack Earth, what will happen??? World War reveals not a nuclear war but a war between Earth and space. 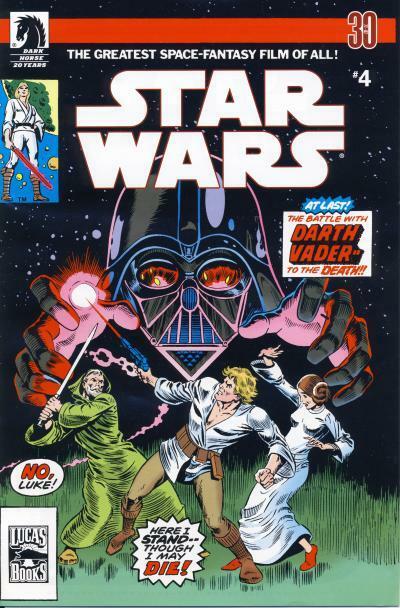 The second issue, published in September 1978, contains Marvel Star Wars #1 - 3 and also has 54 pages of story. This second issue's cover contains original art. It depicts the main heroes from the movie, Luke Skywalker, Han Solo, Princess Leia, Chewbacca, C-3PO, and R2-D2. It also contains English on the cover like the first issue. The last panel on the last page of the story shows the Indonesian word Tamat which means Completed. It isn't clear why the first issue contains Marvel Star Wars #4 - 6 and the second issue contains Marvel Star Wars #1 - 3. I find it interesting that the comic created by Cypress which was published in August 1978 contains redrawn art from Star Wars #4 - 6 but used original art for the first half of the adaptation. Is it possible Star Wars #1 - 3 were not available when these 2 comics were being created? In either case, 2 months later, the second issue does contain Marvel Star Wars #1 - 3. The back cover has an ad with art by legendary Filipino comic book artist Alfredo Alcala. 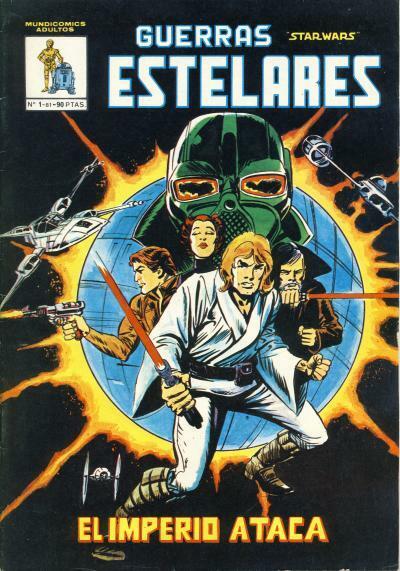 The second publisher of Star Wars comics in Spain was Ediciones Vértice which published 9 magazine sized issues in 1981 and 1982. These comics reprinted the material that was originally published by Editorial Bruguera and are considered foreign reprints. 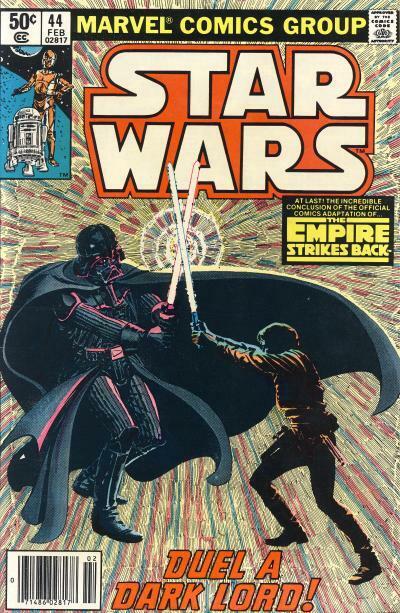 The first issue contains Marvel Comics Star Wars #1 and 2. 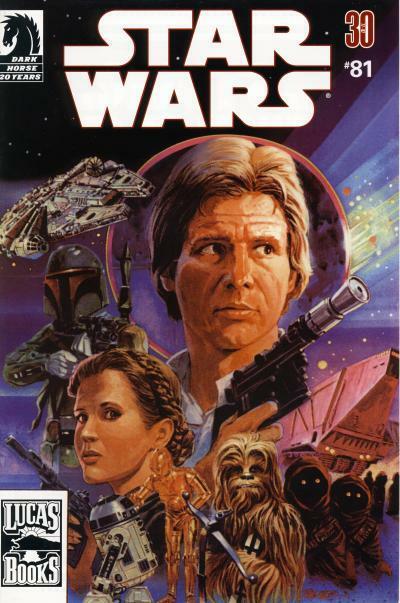 The cover is a redrawing of the cover to Marvel Star Wars #1. It follows the original's color scheme with a tan jacket on Han Solo and a green helmeted Darth Vader. The Star Wars #1 6th print came out on July 8th with a double cover. The interior cover is the green 6th print cover, and the outer cover is the 1st print cover. There is no variant for this issue since every single copy has the double cover. But, that has not stopped people from paying as much as $20 for a copy on eBay. The previous reprints of Star Wars #1 all had over 10,000 copies printed and there is no reason to believe this issue will not have roughly the same number of copies. That coupled with the fact that there is no variant here, makes this a poor book to speculate on. And if this book was legitimately "rare" (which it is not), it would be very easy for someone to marry a 1st print cover to a 6th print book. This is one "investment" I would avoid. As far as I know, there was only one comic variant in the Hasbro Star Wars Comic Packs. Issue #11 was released both with and without the Star Wars 30th Anniversary logo. When Star Wars Comic Pack #11 was first released, Star Wars was celebrating it's 30th anniversary and many Star Wars products contained logos celebrating this milestone. A year later, when this comic pack was re-released, the comic was altered and the logo was dropped. Neither version is more rare than the other and the difference is not noted by sellers. The Comics Chronicles has released the June estimated sales and the slew of Secret Wars tie-ins did not knock the Star Wars and Darth Vader titles out of the top 10 books. Star Wars #6 was ranked 3rd and Darth Vader #6 was ranked 6th for the month with estimated sales very little changed from last month. The penultimate issue of the Princess Leia mini-series dropped roughly 1/5th of it's sales and just missed the top 10. Kanan: The Last Padawan #3 fell around 8,000 copies and is now selling at roughly half of the debut issue. Despite Kanan's lower numbers than the other Star Wars titles, the title is still in safe sales territory as Marvel's cancellation numbers are around 20,000 - 25,000 copies. With the Star Wars Rebels series returning to Disney XD for another season, I'm hopeful the title will stop shedding sales and begin to stabilize it's numbers. Both the Star Wars and Darth Vader Director's Cut comics sold reasonably well considering they are just more expensive reprints of the first issues of these series. Please read the blog posting June 2015 comics sales estimates online; seven titles over 100,000 copies. 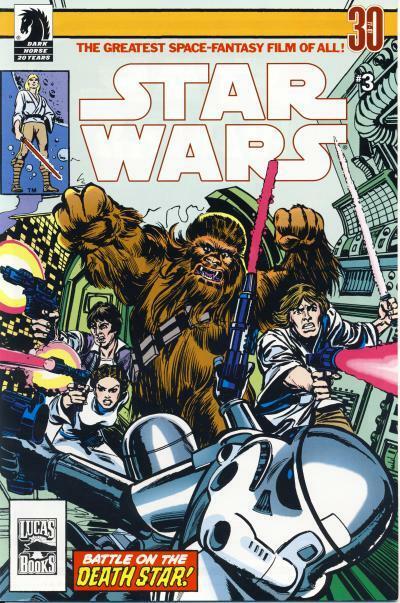 A surprising number of Marvel Star Wars comics were reprinted for the Hasbro Star Wars Comic Packs line. Out of the 57 comics released in these 2-packs, 10 of them are reprints of Marvel Star Wars comics. The first wave of Star Wars Comic Packs after the internet retailer exclusive reprinted Marvel Star Wars #1 - 3. 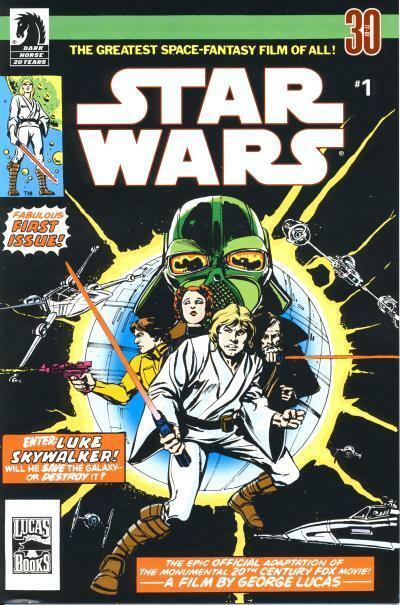 The next wave also contained a Marvel reprint, this time Marvel Star Wars #4. Subsequent waves saw reprints for Marvel Star Wars #44, 68, 69, 81, 94, and 96. Of the covers, only the cover to Star Wars Comic Pack #26 is significantly altered from the original. The stylized background is dropped behind Darth Vader and Luke Skywalker, giving it a much different look than the original cover. I can only guess this was easier than trying to producing the "missing" background art behind the altered smaller title. If the solid demand that we are seeing right now for all the other Star Wars variant editions is any indication, these are going to very quickly be in very high demand, too. With six Star Wars films now planned over the next five years, we anticipate that the Marvel Star Wars titles could easily be out-selling their entire superhero line within a very short period. Mile High Comics is betting big on Marvel Star Wars comics. In addition to shop exclusive variants for Star Wars #1 - 6 and Princess Leia #1 - 5, Mile High will also have shop exclusives for Star Wars #7 - 12. Many newsletter's have talked about how Mile High is ordering big on the Star Wars titles. It wasn't until I saw the Bleeding Cool article Mile High Comics Spent $150K On Star Wars Variant Covers - And Has Just Broken Even that I realized the investment that Mile High Comics is making in the new Marvel Star Wars titles. Rozanski's shop was around in 1977 when the original Marvel Star Wars comics were released and undoubtedly he has first hand knowledge the impact the original Star Wars #1 had on comics. I suspect he sees the huge potential these comics will have this year with a new movie on it's way. Starting in September 2006, Hasbro began issuing Star Wars Comic Packs which contained 2 action figures and a comic published by Dark Horse. Previously in 1996, Hasbro released a couple of action figure 2-packs with comics in the Shadow of the Empire toy line. The new comic packs allowed Hasbro to produce action figures based on Expanded Universe characters shown in the comics. These comic packs were produced until November 2010 when online retailer Entertainment Earth received the final 4 comic packs as shop exclusives. A total of 57 comics (and 1 comic variation) were produced for these 2 packs and all the comics are reprints from Marvel or Dark Horse stories. The comics are numbered separately from the toy package and only issues #1 - 49, 51 - 56, 59, and 75 exist. 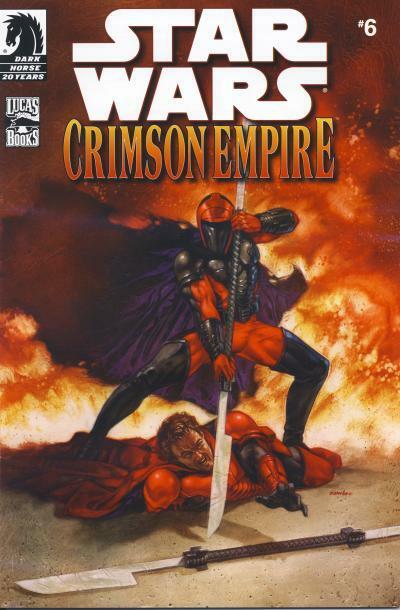 The first Star Wars Comic Pack contains a reprint of the Star Wars: Crimson Empire #6 comic and was released as an internet retailer exclusive. This comic pack was re-released by Hasbro with new packaging for brick and mortar stores, but the comic inside the package did not change. I ran across a June-December 2015 catalog from Dark Dragon Books, a comic book publisher based in the Netherlands. Starting in July 2015, they are going to be publishing 72 page movie adaptations of the original three Star Wars movies in trade paperback format. It is civil war. The spaceships of the rebels have their first victory over the evil Galactic Empire. During the fight the rebels have stolen the secret plans for the ultimate weapon of the Empire. Plans for the Death Star, an armed space station that can destroy entire planets. Princess Leia rushes home with the stolen plans that can ensure that her people can be saved and peace can be fixed in the universe. But they are pursued by the Imperial Storm Troopers. These comic books are aimed at an all age audience and are being released in several foreign markets. Jedi News ran an article concerning these comics. These are officially licensed by Disney and I am hopeful they will make their way to the U.S. Please visit Original Star Wars Comics Come to Brazilian Market where you can see more interior pages from these comics. You may have noticed the number of blogs have been light the last few weeks as I was on vacation with my family in Europe. I wrote 4 blogs before leaving and published those while I was overseas. Naturally, my European vacation was dominated by family activities, but I did have the opportunity to visit a few comic book stores while I was there. I visited shops in Amsterdam, Brussels, and Frankfurt. Late last year, I was in Paris on a business trip and both European visits have cemented a truth that I was unaware of before; U.S. editions of comic pamphlets are very popular in Europe. In my two visits to Europe in the past year, I have visited more stores that sell mostly U.S. editions of pamphlets along with European produced content in the form of trade paperbacks and graphic novels with only a token representation of the foreign editions pamphlets of U.S. material if any at all. When it comes to foreign translations of U.S. material, it seems Europeans would rather consume the material in the original U.S. pamphlet or translated into their native language in trade paperbacks and graphic novels. This is not to say that foreign editions cannot be found, because they can, but in my experience, most comic shops seems to deal mostly with the U.S. editions when it comes to Marvel, DC, Dark Horse, IDW, Boom Studios, Dynamite Entertainment, etc. When you are hunting for older foreign material like I do, there are shops that cater to this, but they are not as plentiful as those shops that sell new material much like comic shops in the U.S. What I have found is used bookstores can be a great asset when seeking out the older material or online auction and sales sites. Like in the U.S., superheroes seem to rule the day when it comes to the shops that sell U.S. editions. I have visited several shops on my visit that contained no Star Wars comics at all, except for collections in trade paperbacks, but they had ample copies of Spider-Man, Avengers, X-Men, Batman, and other superheroes comics. This is not to say I did not have any success locating foreign editions of Star Wars comics on the trip, because I did. Like my visit to France, I found more comics than I could reasonably bring home and I will post blogs about those comics I did purchase. Amsterdam did not yield any Dutch Star Wars comics, but I was hopeful about Brussels. Brussels is known as the "capital of comics" and home to the Belgian Comic Strip Museum. What was fascinating about Brussels compared to other European cities I have visited, is it was not dominated by U.S. superhero comic books, but by European flavored graphic novels. Tintin, Spirou, Asterix, Smurfs, Thorgal, and many other European comics were found in many book stores throughout the tourist portion of the city. I found three of the new Marvel French Panini Comics Star Wars #1 issues, several of the French Atlas (Delcourt Comics) issues, and the French Titans series which contains French translations of the original Marvel Star Wars title in a comic shop called Utopia. I did find a small comic shop that also had one Junior Press Star Wars issue #22. Finally, I also went to Canal BD where I picked up their exclusive French Panini Star Wars #1. Germany did not have a lot in the way of comic shops to visit. We visited Baden-Baden, Heidelberg, and a little town called Oberwessel which had no comic shops in walk-able distance. I did visit two comic shops in Frankfurt, but they were a bust. I did pick up a copy of the German Panini Comics Star Wars #124 which contains the first half of Darth Maul: Son's of Dathomir at the large bookstore chain Schmitt & Hahn at the Frankfurt train station. Unbelievably, yet another Chinese comic adaptation of Star Wars: A New Hope has been found. This adaptation starts with Luke Skywalker watching the Princess Leia recording he stumbles across while cleaning R2-D2 and proceeds to follow the movie from there. Like many of the other adaptations, some of the characters look slightly like their movie counterparts. In addition to starting with the Princess Leia recording scene, this adaption takes huge liberties with the ending battle. The cover depicts one of the 1950s styled astronauts that goes to battle against the Death Star. The Landspeeder is recognizable in this story, but the Millennium Falcon looks like a Buck Rogers space craft. Chewbacca is portrayed more like he is in the movie, something many of these Chinese adaptations do not do. Surprisingly, it is Darth Vader's depiction that has the most liberties; he is shown with binocular styled protruding eyes and a pronounced muzzle where his mouth piece is. His helmet is also enlarged, but not as large as the helmet worn by Dark Helmet in the Spaceballs spoof. 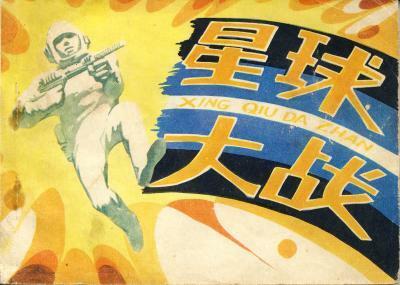 One thing I failed to point out earlier is many of these Star Wars lianhuanhua adaptation are subtitled Xing Qiu Da Zhan, which is the Pinyin translation of Star Wars in Chinese where 星球大战 also translates to Star Wars but uses Chinese characters.